Scenic Marquette County, located in Michigan’s Upper Peninsula, is an ideal destination for outdoor enthusiasts looking to escape the big-city life. Marquette is located 292 miles north of Milwaukee and 382 miles from Chicago. Marquette County has a population of just above 68,000 and is home to a dedicated group of mountain bikers who have built over 100 miles of singletrack. The trails were even given IMBA’s Bronze Level Ride Center award. This may have you wondering why we would book a trip to Marquette at the beginning of February when all the trails are covered in snow and the temperatures are way below freezing. To be honest, we thought we were crazy too, until we read a quote from mountain biking icon Gary Fisher, who wrote, “You want to come and ride your mountain bike in the winter? Come right here to Marquette. 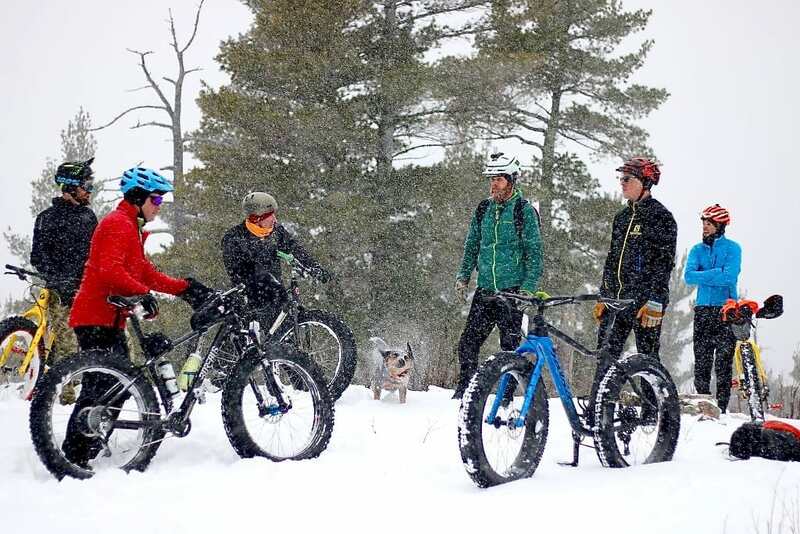 You won’t be disappointed.” Fisher’s endorsement along with some rad YouTube videos of Hall of Fame mountain biker Travis Brown tearing it up on snow-covered singletrack spiked our curiosity and led us on an adventure to see what fat biking in Marquette is all about. Load ’em up: Marquette is a bike-friendly town, but to get to the best trails you’ll need to load up your bikes and head out to the trailheads. Marquette County is no stranger to snow days. In fact, due to the lake-effect storms, caused by the movement of cold air over the Great Lakes, it’s not uncommon for Marquette to get over 200-inches of snow per year. Back in the ’70s when BMX was all the rage, riders attached studs to their 20-inch wheels and built snow pumptracks and large jumps with soft powder landings. 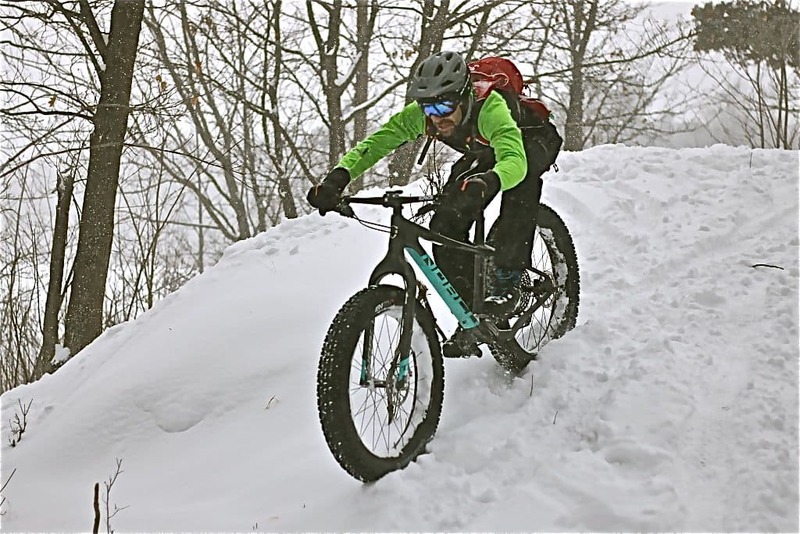 As mountain biking became popular, riders continued to try to ride in the snow, but it wasn’t until the first fat bikes appeared in Alaska over a decade ago when Marquette’s passion for riding in the snow really began to grow. 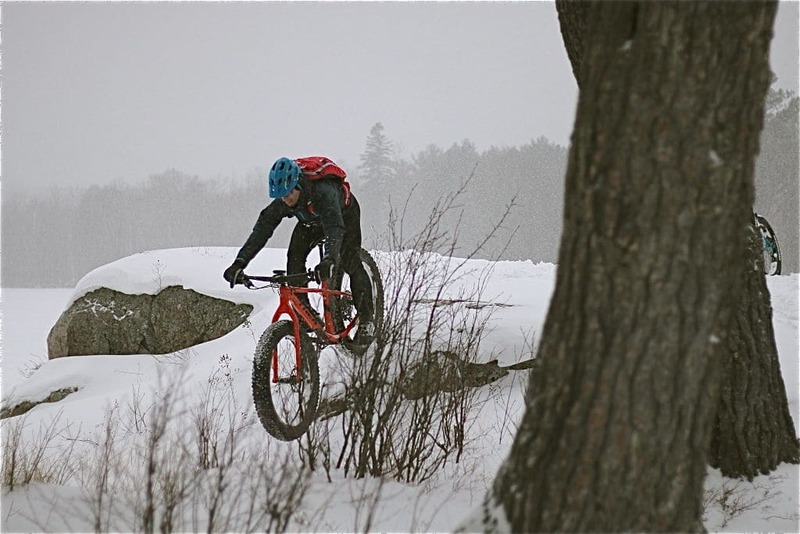 Over seven years ago Marquette locals began riding fat bikes on the snowy trails that had been packed down by snowmobiles, skis and even snowshoes. Grooming equipment began to evolve as well, and now there more than 60 miles of groomed singletrack in Marquette County. Although Alaska is credited for creating the fat bike, it could easily be argued that Marquette deserves the credit for creating the first-ever fat-bike singletrack. The key ingredient to Marquette’s success in building singletrack trails for fat bikes is their constant push to innovate their grooming equipment. In the beginning, riders followed the tracks made by snowmobiles or rode trails groomed for nordic skiers. The combination of fat bikes mixed with speedy snowmobiles created a dangerous environment, so Marquette’s local mountain bikers decided to build dedicated fat-bike trails complete with berms, jumps and other fun features. The equipment required for this was simply unavailable, so many of the grooming tools had to be fabricated. Some groomers attached sleds with custom blades, plows and weights to their snowmobiles so they could build trails in just one pass. Other groomers used two-wheel-drive Rokon motorcycles with small tires dragged behind them, lying on their side. The tires could then be modified with blades and weights that allowed groomers to build fun, yet challenging trails. What truly makes Marquette the fat-biking mecca of the Midwest is the locals’ ability to provide riders from different ability levels with diverse snow-covered singletrack that all riders can enjoy. Bring the right bike: Riders will want to bring or rent a fat bike with tires as wide as 4 to 5 inches. A dropper post is also a welcomed feature. Snow riding is unlike many other forms of cycling, so having the right tools for the job is extremely important. First off, you will need a fat bike. During our time on the trails we found the most common fat bikes in the area were from Salsa, Trek and Norco; however, just about any fat bike should do the trick. Tire widths ranged from 4 to 5 inches and pressures could be run anywhere from 2-6 psi, depending on conditions and rider weight. We found lightweight, carbon fat bikes with super-wide tires and no suspension had the most float over the snow, making it easier to keep momentum moving forward; however, our much-less-expensive Salsa rental bike conquered the trails just fine. Studded tires are generally not needed unless the snow is particularly icy that day or you wish to rip laps over frozen lakes. Riders will, however, want bikes with fairly low stand-over heights and dropper seatposts. This is due to the fact that the sides of the trails have deep powdery snow that a riders’ feet can sink into when they dismount. Trust us, you’ll want all the clearance you can get. Another upgrade many local riders do to their bikes is add a pair of Bar Mitts, so they can use thinner gloves, providing better feel of the bike’s controls, while still keeping their hands warm. Stay warm: Bar Mitts are a great way for riders to keep their hands warm while wearing thinner gloves. This setup gives riders the best balance of comfort and control. Keep it burning: A warm fire is essential for warming up your hands after a cold day in the snow. Being comfortable will make or break a ride in the snow. The two most important areas to protect are your hands and feet. We highly suggest getting warm weather gear from a reputable company, such as Gore Bike Wear. Above-the-ankle shoes, like the ones from 45NRTH, will also be highly appreciated when out on the snow. Make sure to layer up. Wear a base layer, a good pair of tights and a thermal jersey. Then, cover it all up with a waterproof jacket and pants. Extra coverage for your head will also be required on colder days, so pack a warm beanie or headband that can be worn under your helmet. Having the appropriate gear that keeps you dry and comfortable will give you the best snow-biking experience possible. During our trip to Marquette we were hit with a good amount of snowfall that made the trails more challenging to ride; however, we never got discouraged. It was easy for us to imagine what these trails had to offer. The rolling singletrack through trees with tall berms begs riders to get off the brakes and let ‘er fly. We truly felt like we were blasting through singletrack, but with fresh snow surrounding us. Riding out to Lake Superior is also an unforgettable experience, because it feels as if you stumbled upon an icy Alaskan shoreline. We spent most of our time at Harlow Lake, a recreational area with cabins available to rent and ice fishing just a few steps away. The lodgings have tiny wood stoves inside, perfect for warming up after a cold ride. There’s also an outdoor fire pit. Riding in the snow with low-pressure tires requires riders to stay loose and plan out their lines carefully. The softer tires tend to slow down steering input; however, the trails, during the right conditions, can still be ridden fast. Advanced riders will have no trouble catching a little hang-time or doing some two-wheel drifting around turns. Beginner riders will also have a blast as wide, fat tires boost their confidence and control over the snowy groomed trails. Riders brave enough to face the cold weather and keen to try a new winter sport should check out what Marquette’s fat biking is all about. We know we were pleasantly surprised, and we think you might be, too. For more information about fat biking in Marquette, head to www.travelmarquettemichigan.com.